As practically no two members of the society have exactly the same exlibristic interests, the editors of its publications have to ensure that there is a variety of subject matter in its publishing programme. 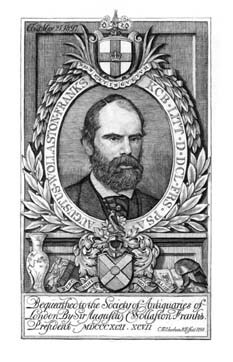 The annual members' books have ranged across a wide range of topics over the years and will continue to do so: the 2003 book was on some bookplates of heralds, that of 2004 researched parochial libraries, the 2005 book covered all bookplates in the trophy style, while for 2006 a history of Scottish Bookplates was issued. The 2007/8 book East Anglian Ex-Libris, by John Blatchly FSA, is a sequel to his 2000 book on Norfolk and Suffolk ex-libris. For 2009/10 we circulated to members Karen Livingstone's new book on The Bookplates and Badges of C.F.A. Voysey, published by the Antique Collectors Club. For 2011/12 we issued to members The Heraldic Bookplates of Miss C. Helard, by Colin Lattimore. It deals with designs by the wife of heraldic authority Arthur Fox-Davies. A book will follow on the ex-libris of people who were notable in the history of the British Isles. We also look forward to learning about Welsh Bookplates, a hitherto neglected area of study; the text is in preparation by our member Tom Lloyd, drawing on his own collection and on the holdings at the National Library of Wales. The Bookplate Journal was relaunched in 2003 in a much improved and enlarged format, and continues to publish articles on a wide variety of subjects with a balance being maintained as far as possible between studies of the older armorial style of bookplates and the more modern pictorial seam. Contemporary work from home and abroad finds its place too. A substantial portion of each issue of the Journal is reserved for notes, queries, answers, reviews, etc. in order to ensure that ideas and information of a less weighty kind can be disseminated freely. Details of the contents of recent issues of Bookplate Journal are given on the News and Events page and a fuller list is given here. The last twenty years have seen a multiplicity of documentation in the field of bookplate research and this, happily, continues at present with arguably even greater activity than before. During the course of a year many bookplates are scanned for reproduction in the society's publications, principally the Bookplate Journal and the annual members' book. Rather than simply discard these images they are now being stored on CD for future reference. A database enables browsing of the images (at low resolution) and searching for specific owners, styles, dates, engravers, or, indeed, any subject heading that is included in the recorded data. Illustrations are increasingly provided from original bookplates, with recourse to good quality photocopies when necessary, so the images available in the database, scanned at 300dpi, are of reproduction standard. The image bank is presently quite small but is growing steadily, with the eventual intention being to make the searchable database available on the internet. A database of British bookplates is being complied by Anthony Pincott, to appear eventually on CD-ROM. The main steps in this project are the digitisation of the Franks Catalogue (almost complete), the cataloguing of bookplates in the Viner Collection, the integration of entries compiled by Dr J. S. Pearson (whose bookplates are now at Yale), the inclusion of bookplates in other public and private hands, and the cross-referencing to bookplate literature. The intention is to include such biographical, heraldic and topographical information as comes to hand. This major undertaking will result in a single database holding records of some 80,000 British and American bookplates. Publication is not expected before 2009 at the earliest. It is hoped that this valuable tool will in later years facilitate the cataloguing of other collections by reference to this database, and to the discovery of many additional examples for inclusion. In August 2006 at the International Exlibris Congress in Nyon, Switzerland, Anthony Pincott gave an illustrated talk entitled Creating an ex-libris database: the example of the Franks Collection at the British Museum. This is now available at FISAE Talks. Until such time as the above databases can be made available, requests for searches and for images of bookplates will be handled on an ad hoc basis as a service to members. This is also available to non-members, for which a modest charge may possibly be made.